باقری, رسول, آیت‌اللهی, مجتبی, محمودی منفرد, مجتبی. (1395). تحلیل تنش خارج صفحه‌ای در باریکه ساخته شده از مواد تابعی محدود شده توسط دو نیم صفحه الاستیک حاوی چندین ترک در فصل مشترک باریکه و نیم صفحه. نشریه پژوهشی مهندسی مکانیک ایران, 18(3), 45-60. رسول باقری; مجتبی آیت‌اللهی; مجتبی محمودی منفرد. "تحلیل تنش خارج صفحه‌ای در باریکه ساخته شده از مواد تابعی محدود شده توسط دو نیم صفحه الاستیک حاوی چندین ترک در فصل مشترک باریکه و نیم صفحه". نشریه پژوهشی مهندسی مکانیک ایران, 18, 3, 1395, 45-60. باقری, رسول, آیت‌اللهی, مجتبی, محمودی منفرد, مجتبی. (1395). 'تحلیل تنش خارج صفحه‌ای در باریکه ساخته شده از مواد تابعی محدود شده توسط دو نیم صفحه الاستیک حاوی چندین ترک در فصل مشترک باریکه و نیم صفحه', نشریه پژوهشی مهندسی مکانیک ایران, 18(3), pp. 45-60. باقری, رسول, آیت‌اللهی, مجتبی, محمودی منفرد, مجتبی. تحلیل تنش خارج صفحه‌ای در باریکه ساخته شده از مواد تابعی محدود شده توسط دو نیم صفحه الاستیک حاوی چندین ترک در فصل مشترک باریکه و نیم صفحه. نشریه پژوهشی مهندسی مکانیک ایران, 1395; 18(3): 45-60. در این مقاله با استفاده از روش توزیع نابجایی تحلیل تنش در باریکه ساخته شده از مواد تابعی محدود شده توسط دو نیم صفحه الاستیک حاوی مجموعه ای از ترکها در فصل مشترک باریکه و نیم صفحه ایزوتروپیک تحت بار خارج صفحهای انجام شده است. ابتدا حل نابجایی در منطقه با حل معادله حاکم، اعمال شرایط مرزی و شرایط پیوستگی مربوط به نابجایی با استفاده از تبدیل فوریه انجام میگردد. بعد از اعمال شرایط مرزی میتوان معکوس تبدیل فوریه را اعمال نمود و میدان تنش ناشی از نابجایی را در باریکه با خواص تابعی و نیم صفحه الاستیک محاسبه نمود. سپس با استفاده از این حل، معادلات انتگرالی برای تحلیل مسأله چندین ترک واقع در فصل مشترک باریکه و نیم صفحه الاستیک بدست میآیند. این معادلات از نوع تکینگی کوشی می باشند که با استفاده از روش عددی مناسب حل گردیده تا تابع توزیع نابجایی روی ترکها بدست آید. با بدست آوردن توزیع نابجایی روی ترکها میتوان ضرایب شدت تنش برای نوک ترکهای واقع در فصل مشترک را بدست آورد. Volterra, V., "Sur Pe'quilibre Des Carps Elastiques Multiplement Connexes", Annales Scientifiques De l’Ecole Normale Superiure, Paris, Series 3, Vol. 24, pp. 401-517, (1907). Ashbaugh, N., “Stress Solution for Crack at an Arbitrary Angle to an Interface”, International Journal Fracture, Vol. 11, pp. 205-219, (1975). Grag, A.C., “Stress Distribution Near Periodic Cracks at the Interface of Two Bounded Dissimilar Orthotropic Half-planes”, International Journal of Engineering, Vol. 19, pp. 1101-1114, (1981). Ozturk, M., and Erdogan, F., “Anti-plan Shear Crack Problem in Bonded Materials with a Graded Interfacial Zone”, International Journal of Engineering Science, Vol. 31, pp. 1641-1657, (1993). Chen, Z. T., Karihaloo, B. L, and Yu, S. W., “A Griffith Crack Moving Along the Interface of Two Dissimilar Piezoelectric Materials”, International Journal of Fracture, Vol. 91, pp. 197-203, (1998). Das, S., and Patra, B., “Stress Intensity Factors for Moving Interfacial Crack between Bonded Dissimilar Fixed Orthotropic Layers”, Computers and Structures, Vol. 69, pp. 459-472, (1998). Li, X. F., and Wu, X. F., “A Moving Mode-III Crack at the Interface between Two Dissimilar Piezoelectric Materials”, International Journal of Engineering Science, Vol. 38, pp. 1219-1234, (2000). Wang, Y.S., and Gross, D., “Interaction of Harmonic Waves with a Periodic Array of Interface Cracks in a Multi-layered Medium: Anti-plane Case”, International Journal of Solids and Structures, Vol. 38, pp. 4631-4655, (2001). Lee, J. S., Kwon, S. M., Lee, K. Y., and Kwon, J. H., "Anti-plane Interfacial Yoffe-crack between a Piezoelectric and Two Orthotropic Layers", European Journal of Mechanics A/Solids, Vol. 21, pp. 483-492, (2002). Bi, X.S., Cheng, J., and Chen, X. L., “Moving Crack for Functionally Grated Material in an Infinite Length Strip under Anti-plane Shear”, Theoretical and Applied Fracture Mechanics, Vol. 39, pp. 89-97, (2003). Ma, L., Wu, L.Z., Zhou, Z.G., and Zeng, T., “Crack Propagation in a Functionally Graded Strip under the Plane Loading”, International Journal of Fracture Vol. 126, pp. 39-55, (2004). Das, S., “Interaction of Moving Interface Collinear Griffith Cracks under Anti-plane Shear”, International Journal of Solids and Structures, Vol. 43, pp. 7880-7890, (2006). Li, R., and Kardomateas, G. A., "The Mode III Interface Crack in Piezo-electro-magneto -elastic Dissimilar Bimaterials", Vol. 73, pp. 220-227, (2006). Cheng, Z., ”Crack Propagating in Functionally Graded Coating with Arbitrarily Distributed Material Properties Bonded to Homogeneous Substrate”, Acta Mechanica Solida Sinica, Vol. 23, pp. 437-446, (2010). Cheng, Z., Gao, D., and Zhong, Z., “A Moving Interface Crack between Two Dissimilar Functionally Graded Strips under Plane Deformation with Integral Equation Methods”, Engineering Analysis with Boundary Elements, Vol. 36, pp. 267-273, (2012). Bagheri, R., and Ayatollahi, M., “Multiple Moving Cracks in a Functionally Graded Strip”, Applied Mathematical Modelling, Vol. 36, pp. 4677–4686, (2012). Korsunsky, A. M., and Hills, D. A., “The Solution of Crack Problems by using Distributed Strain Nuclei”, Part C, Journal of Mechanical Engineering Science, Vol. 210, No. 1, pp. 23-31, (1996). Erdogan, F., Gupta, G. D., and Cook, T. S., “Numerical Solution of Singular Integral Equations, Method of Analysis and Solution of Crack Problems”, Edited by G. C. Sih, Noordhoof, Leyden, Holland, (1973). 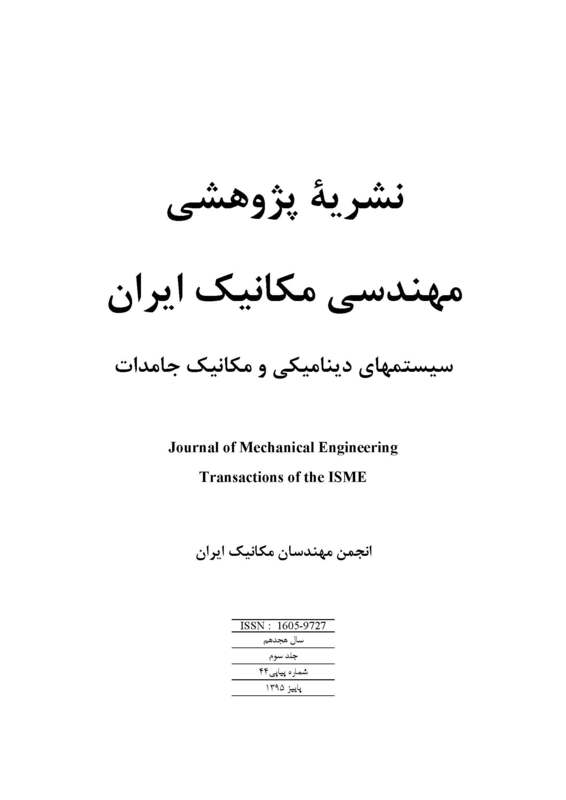 Faal, R. T., Fotuhi, A. R., Fariborz, S. J., and Daghyani, H. R., “Antiplane Stress Analysis of an Isotropic Wedge with Multiple Cracks”, International Journal of Solids and Structures, Vol. 41, pp. 4535-4550, (2004).